It is a bout we have speculated about for many months, some even years, a bout celebrated before its own crowning. It served as our foundation, bolstering our bias that the Mayweather- McGregor circus was merely a heist impairing the pockets of Boxing and MMA fans alike. This was a bout brought upon by boxing purists. I lined my bets with my primary broker as many of you did; I had already picked my winner with unwavering confidence. Tonight’s action has long been on our hearts and tongues and while disappointment flew far from our minds. The fight was initiated with dazzling speed and intention being laid at the door of the opening round. Both fighters beaming with confidence and focus while we glared with admiration at the chiselled form and mass that Canelo displayed. Golovkin was quick to implore the offense, walking Canelo down, with a sniper’s jab while Canelo served him with movement around the edges of the squared ring. My immediate concern given my bet was whether Canelo would be able to shore up the energy stores to fuel the movement he has been known for, as GGG released threatening hooks. In the last 40 seconds; Alvarez was proving his notable speed delivering partial over hand rights while evading Golovkin’s blows. Very difficult to give the round to any of the two but I will give GGG the round, directed aggression but it is Alvarez who landed the more effective blows. 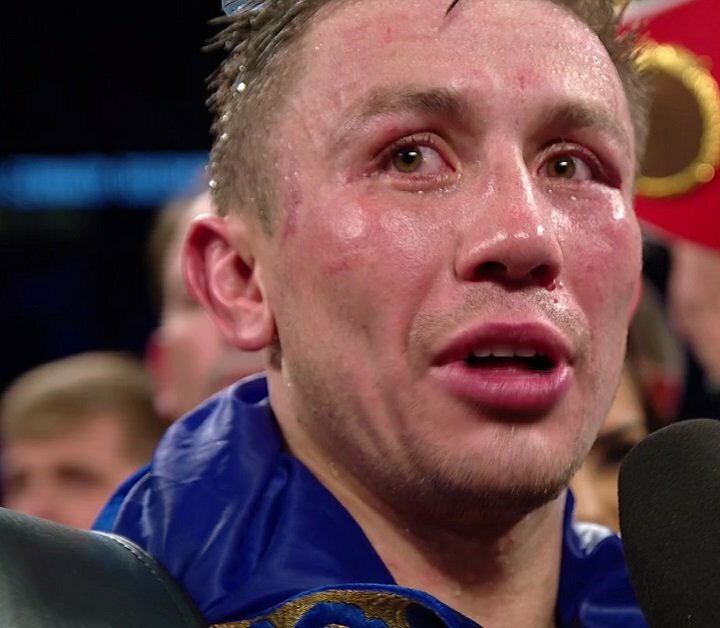 I am surprised to see that Golovkin is fighting with such veracious intent; he is usually a fighter who only comes into form, in the middle rounds. Tonight he is firing away from his battle tank, marching Alvarez down. He is aware that he is fighter a higher calibre foe, than that we have seen before. He has to close the distance early to ensure that Alvarez has no chance of building a leading margin. However he is GGG and it is imperative for his cause that he lands a defining punch early to puncture the confidence and movement of the young bull in front of him. At two minutes an explosive Canelo landed a left upper-cut followed by a right which drew attention to effective arsenal he is putting together. If he continues in this fashion he is going to be hurting Golovkin in ways untold. He swiftly switched two a double jab, targeting Golovkin’s gas tank. As a promising Mexican right misses, It is quite clear to me that Alvarez is committed to landing punishing blows to test Golovkin’s standing. Golovkin seems content to try evade the explosive skirmishes as Alvarez seizes control of the offense mantle. They are fighting in the confines of a booth; some punches are landing, many more are missing. It is clear that, speed still favors the younger man who is able to deliver his retribution while narrowly evading Golovkin’s blows. Decision: Alvarez 10-9; notable round he is technically the better boxer and has displayed his power rather well. Golovkin starts out with early aggression and flurries which do not prove effective but catch attention. It is still wonderful to see Alvarez’s movement evading punches when quarters prove too close. I am seeing some Kronk Gym defensive brilliance in his is approach, must have learnt something from his bout with Mayweather. Landing more hooks to Golovkin pelted body, while they waltz at the centre of the ring. Canelo is beaming; confident in his ability to exploit the opening this approach unveils. Golovkin returns fire, throwing his best left hook following it with a tapping jab. Alvarez remains impressive with his sharp movement and punches, using the left hook to the body and right combination with ease. We’re clearly seeing a pattern emerge, as Alvarez continues to deliver variations of hook combination to Golovkin’s head and torso. It is the effective delivery of the hooks to the body that draws my appreciation. Their purpose is to tire the Kazak warrior in the early rounds, bleeding his gears. Towards the end of the round, Golovkin is back on the offensive landing a beautiful left while Alvarez edges the ring’s ropes. Although I have noted that Alvarez’s energy stores are sapping; it is still the Mexican who explodes with defiant combination punishing Golovkin’s blows. Golovkin is throwing more combinations as he increases his offensive momentum; pressing the Mexican towards the ropes. I can’t believe the confidence this young man is displaying, begging the Kazak in to deliver the blows. I can assure you, not many have had the ability to engage in such against a man who is known to paralyse opponents with his boulders. Tired as he may be Canelo remains in control of this bout. Beautiful action from both fighters. Canelo’s movement is really frustrating Golovkin, who is more tentative about throwing those impaling punches. Decision: Golovkin round 10-9. He was the effective aggressor, landing some telling blows. The action continues with the determined Golovkin walking Canelo down and effectively cutting the ring off. Canelo is still displaying his defensive prowess weaving from the hooks. Golovkin seems to be focusing his attention on delivering head shots which continue to miss the young bull. There we go within a minute left of the fifth round. Golovkin exploits Canelo’s complacency against the ropes and catching the young bull’s cranium beautifully with one of his notorious looping right-hand punches. That was his best punch thus far in the bout. Canelo’s bravado remains alive, shaking his head to dismiss the effects of such blows but it is Golovkin who is turning momentum in his favor. Canelo explodes in another flurry off the ropes spinning Golovkin back as the crowd roars at the action served. Decision: Golovkin round 10-9; by far his best round. Not distracted by Canelo’s movement and impressed himself. Golovkin is still on an offensive gear; Canelo is unrelenting in delivering piercing upper cuts when GGG is left vulnerable. The action is at the centre of the ring and with his hand held low it is the Mexican who is delivering effective punches. Golovkin is switching his punches to the body as he sense the Mexican is tiring. Canelo still throwing combination hooks and rounding it off with his own right as he displays his brilliant defensive skills. Decision: Alvarez round 10-9 I do wonder, if Canelo’s energy is sapped. The Kazak warrior begins the round as if the last never ended but happens to walk into some telling blows by the Mexican warrior. Splendid action. Golovkin is still applying pressure while Canelo explodes from his defensive position into openings unveiled. Alvarev is moving a lot more and throwing punches from the right step he continues to use to evade Golovkin. Golovkin is throwing effective blows in the opening seconds. However it is at the centre of the ring where it is evident that the Mexican throws his best punches. Golovkin is landing heavy right hands when Alvarez’s concentration lapses while lining the ropes. I am very impressed with Alvarez’s defensive skills but am aware that he is not throwing combinations as once before. Decision: Golovkin round. Actively working the body while forcing a tired foe to move more across the ring. Canelo begin the round busy with movement and flurry of boulders from varied angles. An impressive display. A second wind may have ensured. Golovkin delivers his own blows while in close quarters. It is Canelo return that is more impressive as lands a huge right hand off the ropes. Still the determined Kazak warrior continues to press his train. Alvarez’s punches output will have to increase in the coming rounds, he will regret laying off the gas pedal in the middle rounds when he should have been active. It is perhaps the higher mass has impaired his gas tank. Clearly Alvarez is the better fighter who was caught lacking in enduring at the higher weight. Canelo is laboring notable; it is evident to all, that skills belong to him he has to throw a lot more blows to make his case in this fight. His inability to shift gears has allowed GGG ability to impress himself. Round 10, sees Alvarez issue consistent punches setting Golovkin off balance not allowing him to get his weaponry off. Golovkin is still fit and it is his impeccable energy that is allowing him to survive the flurries and pressing his own action. Alvarez is fighting but his punches have seemingly lost their steam. He has thrown some defined blows but their impact has been impaired by his waning gas tank. GGG, back on his opponent, attacking Canelo with feverish pace. Alvarez still moving but he is not landing effective shots. He surprises me with a solid three punch combination. Golovkin is seemingly struggling to find the range again. As Alvarez play is bout against the ropes. The final round is about to begin, it is clear that the 35year old Golovkin is spitting fire out of his train express. Canelo is clawing away, fighting like a crazed lion at the center of the ring and it is effective. Wrestling in clinches and punching away at breaks using the upper cut with good effect and unleashing a rapid array of punches which GGG cannot reply to. Golovkin takes the punishment and retaliates with his own punches. They are fighting at the ropes and the movement along the ropes. Golovkin is coming forward with his tiring pace as they return the centre of the ring. The bout closes and the two are yet to rest from hell’s gauntlet. Decision: Very close round, could reasonably be scored a draw, Canelo edges it for me. I commend both warriors for their output tonight. Adelaide Byrd must really consider giving up her role as judge. It is unacceptable that such dire mistakes continue to soil our sport. However I believe the draw to be a fair decision; similar to that witnessed in the first Ward- Kovalev bout; the second fight will bring us better conclusion of who is fit to be crowned king. Canelo is the more skilled fighter, this bout was his to loose, GGG is effective and grinds his opponents down with phenomenal strength and torrents energy.